I would have to say the trip I made to Belize in Central America in December of 2013 is a prime example of everything turning out just right. After the wonderful and incredible first trip a year before I had some trepidation that the second trip might pale in comparison due to the fantastic experiences and excitement of seeing such a place for the first time. It did not pale in the least. Coming back for a second trip, I had a goal in mind that drove me preparation in such a way that those feelings of vague concern were quickly excised and overcome. There was actually a two-fold focus. One focus was related to finding children;s books to help stock the beginnings of a new library. Through my church 600 books found their way to this tutor center that is intending to give children with little hope of learning the love of books a new reality. But more than that, we wanted to actually take part in making this place better prepared to serve the needs for years to come. Our team was included in the removal and replacement of the old and failing roof. 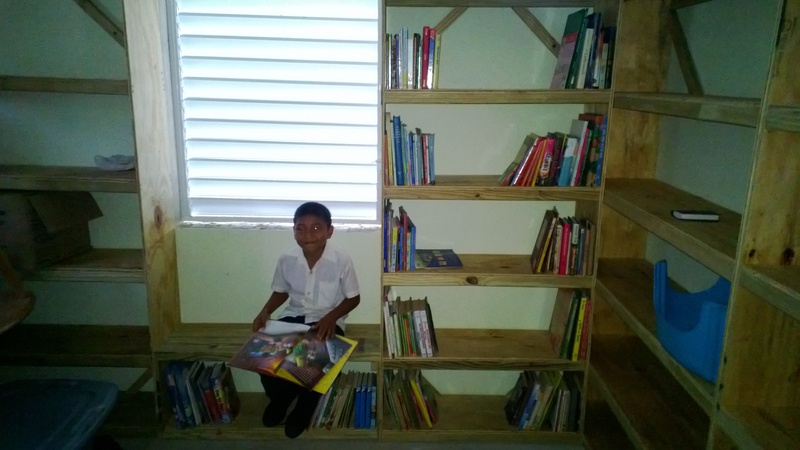 We also had the opportunity to build the shelves that transformed an empty square of a room into a functional library, which was definitely something I wanted to work out. But the other part of the desire for this trip was to bring not only back pack gifts for children, but enough other items to help fill the need of the missionaries that staff this tutor center. At the heart House there is programs to bless children every day. On birthdays the kids receive packages with pencils, paper, books, games and other trinkets of reward. These have to com from somehwere and I wanted that somewhere to be from Virginia where I live. Giving money is always an option, but giving something of substance feels more real to me. So yes, everything turned out exactly as I wished and I believe that was totally connected to doing the right thing for the right reasons. Prayer is still effective and knowing your place in the world and doing what you should will pay dividends. You just have to know what your place is and be willing to submit to the calling placed in your heart. This entry was posted in Daily Prompt, Writing and tagged building libraries, daily post, library, mission trip, postaday, Tutor Center. Bookmark the permalink. sounds like a great trip – and so meaningful!